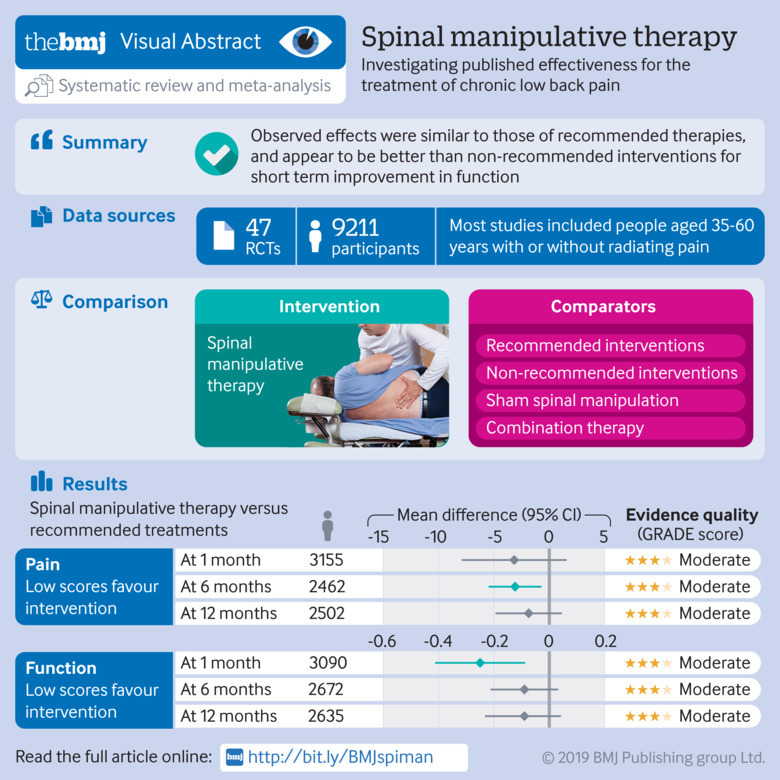 Objective To assess the benefits and harms of spinal manipulative therapy (SMT) for the treatment of chronic low back pain. Design Systematic review and meta-analysis of randomised controlled trials. Data sources Medline, PubMed, Embase, Cochrane Central Register of Controlled Trials (CENTRAL), CINAHL, Physiotherapy Evidence Database (PEDro), Index to Chiropractic Literature, and trial registries up to 4 May 2018, including reference lists of eligible trials and related reviews. 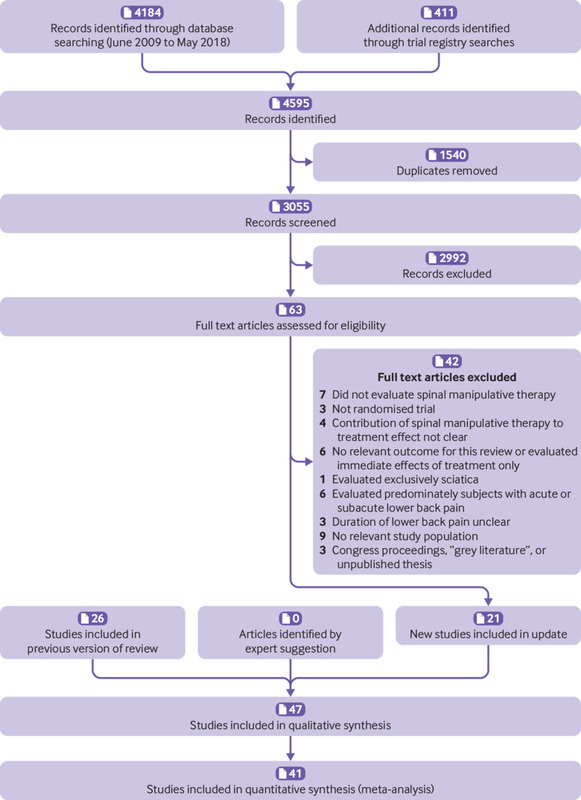 Eligibility criteria for selecting studies Randomised controlled trials examining the effect of spinal manipulation or mobilisation in adults (≥18 years) with chronic low back pain with or without referred pain. Studies that exclusively examined sciatica were excluded, as was grey literature. No restrictions were applied to language or setting. Review methods Two reviewers independently selected studies, extracted data, and assessed risk of bias and quality of the evidence. The effect of SMT was compared with recommended therapies, non-recommended therapies, sham (placebo) SMT, and SMT as an adjuvant therapy. Main outcomes were pain and back specific functional status, examined as mean differences and standardised mean differences (SMD), respectively. Outcomes were examined at 1, 6, and 12 months. Quality of evidence was assessed using GRADE. A random effects model was used and statistical heterogeneity explored. Results 47 randomised controlled trials including a total of 9211 participants were identified, who were on average middle aged (35-60 years). Most trials compared SMT with recommended therapies. Moderate quality evidence suggested that SMT has similar effects to other recommended therapies for short term pain relief (mean difference −3.17, 95% confidence interval −7.85 to 1.51) and a small, clinically better improvement in function (SMD −0.25, 95% confidence interval −0.41 to −0.09). High quality evidence suggested that compared with non-recommended therapies SMT results in small, not clinically better effects for short term pain relief (mean difference −7.48, −11.50 to −3.47) and small to moderate clinically better improvement in function (SMD −0.41, −0.67 to −0.15). In general, these results were similar for the intermediate and long term outcomes as were the effects of SMT as an adjuvant therapy. Evidence for sham SMT was low to very low quality; therefore these effects should be considered uncertain. Statistical heterogeneity could not be explained. About half of the studies examined adverse and serious adverse events, but in most of these it was unclear how and whether these events were registered systematically. Most of the observed adverse events were musculoskeletal related, transient in nature, and of mild to moderate severity. One study with a low risk of selection bias and powered to examine risk (n=183) found no increased risk of an adverse event (relative risk 1.24, 95% confidence interval 0.85 to 1.81) or duration of the event (1.13, 0.59 to 2.18) compared with sham SMT. In one study, the Data Safety Monitoring Board judged one serious adverse event to be possibly related to SMT. Conclusion SMT produces similar effects to recommended therapies for chronic low back pain, whereas SMT seems to be better than non-recommended interventions for improvement in function in the short term. Clinicians should inform their patients of the potential risks of adverse events associated with SMT. In this review, we consider SMT to represent any hands-on treatment of the spine, including both mobilisation and manipulation. Mobilisations use low grade velocity, small or large amplitude passive movement techniques within the patient’s range of motion and control, whereas manipulation uses a high velocity impulse or thrust applied to a synovial joint over a short amplitude at or near the end of the passive or physiological range of motion.8 This is often accompanied by an audible crack, resulting from cavitation of the joint. To resolve the issue of effectiveness, we conducted a systematic review and meta-analysis. This publication is an update of our earlier Cochrane review, which found high quality evidence suggesting no clinically relevant difference between SMT and effective interventions for reducing pain and improving function in patients with chronic low back pain.19 Data for the other comparisons were of lesser quality. The primary objective of this current review was to examine the effectiveness of SMT on pain relief and improvement in function at the short, intermediate, and long term follow-up compared with control treatments for adults with chronic low back pain. Secondary objectives included the assessment of adverse events. The effect of SMT for other secondary outcomes, such as recovery, return to work, and health related quality of life are to be fully described elsewhere as an update of this review and published in the Cochrane Library. We only included published randomised studies. Studies using an inadequate randomisation procedure (eg, alternate allocation, allocation based on birth date) were excluded, as was grey literature. Studies were considered eligible if they included adults (≥18 years) and if more than 50% of the study population had pain lasting more than three months. Additionally, we included studies if the observed differences were thought to be due to the unique contribution of SMT, which may include studies in which SMT was delivered as part of a package of care—that is, if the effects of SMT could be isolated; for example, studies comparing SMT plus exercise with exercise alone would be included, whereas studies comparing SMT plus exercise with SMT alone would not. We excluded participants with postpartum low back pain or pelvic pain due to pregnancy, pain unrelated to the lower back, postoperative studies, patients with serious pathology, and studies that examined “maintenance care” or prevention; in addition to studies that were designed to test the immediate post-intervention effect of a single treatment only as well as those studies that exclusively examined back related conditions (eg, sciatica). We also excluded studies if SMT was combined with other therapies, making it difficult to distinguish the effect of SMT—for example, a study comparing SMT plus exercise with another type of treatment (eg, general practitioner care). This review focuses on the effects of both spinal manipulation (high velocity, low amplitude (HVLA) techniques) as well as mobilisation (low velocity, low amplitude (LVLA) techniques). We examined the effect of SMT compared with recommended therapies, non-recommended therapies, sham (placebo) SMT, and SMT as adjuvant therapy to any other therapy. Sham SMT was any comparator in which SMT involved hand contact, active or passive range of motion, or both, and techniques that simulated SMT but was designed not to deliver a therapeutic effect (eg, light touch or diminished therapeutic force), or even improper care (eg, improper patient positioning or purposely misdirected movements). Although we considered the effect of HVLA SMT versus LVLA SMT (ie, manipulation versus mobilisation) as secondary because it was not included in our protocol, we included this comparison as it represents a point of continued discussion. The primary outcomes were pain intensity and back pain specific functional status. Adverse events and serious adverse events are summarised narratively. We identified randomised controlled trials from an electronic search of several databases (up to 4 May 2018): Cochrane Central Register of Controlled Trials (CENTRAL), Medline, Medline In-Process and Other Non-Indexed Citations, Embase, CINAHL, Physiotherapy Evidence Database (PEDro), Index to Chiropractic Literature, and PubMed. An experienced information specialist carried out the searches according to the recommendations of the Cochrane Handbook.21 In addition, we also screened the reference lists of all included studies and systematic reviews; searched trial registers, specifically, ClinicalTrials.gov and World Health Organization International Clinical Trials Registry Platform (ICTRP); and we sent our selection of studies to trial authors and specialists in SMT to identify any trials potentially missed. Appendix 1 shows the search terms and strategies. Two review authors (SMR, AdeZ) independently screened the titles and abstracts, evaluated the risk of bias, extracted data, and assessed the quality of the evidence (GRADE). Consensus was reached during meetings. Potentially relevant studies were obtained in full text and independently assessed for inclusion. Only full papers were evaluated. No language restrictions were applied. Data extraction and management—A standardised form was used to extract the study design (randomised controlled trial), study and population characteristics, intervention and control characteristics, outcome measures, and follow-up intervals, as well other relevant data, such as source of funding, authors’ declaration of interests, and risk of bias. Final value scores (means and standard deviations) were extracted for the meta-analyses. Change scores were converted into a mean value. Assessment of risk of bias in included studies—risk of bias was assessed according to the 13 criteria recommended by the Cochrane Back and Neck Review Group (see appendix 2). This tool is the same as that recommended by the Cochrane Collaboration, with the addition of items thought to be relevant in the assessment of non-drug trials, such as compliance, use of co-interventions, similarities of the groups at baseline, use of intention-to-treat analysis, and “other” (eg, potential conflicts of interest). We used this tool to evaluate selection bias, performance bias, detection bias, attrition bias, selective outcome reporting bias, and any other forms of bias, such as conflicts of interest. These criteria were scored as low risk, high risk, or unclear risk. Studies with fatal flaws were excluded from the meta-analyses, defined as studies with an exceedingly large drop-out rate or with statistically and clinically relevant important baseline differences, suggesting possibly improper randomisation or selective exclusion of data. Measures of treatment effect—Pain is expressed as mean difference and functional status as a standardised mean difference (SMD), including 95% confidence intervals. All pain scales were converted to a 100 point scale. A negative effect size indicates that SMT is more beneficial than the comparison therapy; meaning that participants have less pain or better functional status. A random effects model was used for all analyses based on the DerSimonian and Laird approach.22 Analyses were conducted in Review Manager 5.3. Assessment of reporting biases—Funnel plots were constructed, where possible, to explore publication bias. Additionally, we examined potential conflicts of interest as well as the funding source. Data synthesis—GRADE was used to evaluate the overall quality of the evidence for each outcome, which ranges from high to very low quality and is based on five domains: limitations of design, inconsistency of results, indirectness, imprecision, and other factors, such as publication bias. Appendix 3 describes the criteria and operational definitions. Assessment and investigation of heterogeneity—A prerequisite to pooling data was based on clinical homogeneity, which is why we stratified the meta-analyses by type of comparison, outcome, and time interval. Statistical heterogeneity was examined by inspecting the Forest plot and was formally tested using the Q test (χ2) and I2. We attempted to explain cases of considerable heterogeneity (defined as an I2 statistic ≥75%) using meta-regression for those comparisons with sufficient data. The following variables were considered a priori: duration of the low back pain (subacute or chronic versus exclusively chronic), type of clinician (chiropractor versus other), type of radiating pain (above knee versus below knee); multimodal SMT (ie, SMT delivered alone compared with examined in a larger, multimodal context or as a package of care), and type of technique (HVLA versus LVLA). After examining the discriminative ability of these variables, we considered the additional variable of country where the study was conducted. Ultimately, we modelled just four variables: duration of the low back pain, type of clinician, multimodal SMT, and country. In the first step we conducted a univariate analysis and in a subsequent step we used the two variables showing the strongest effect to construct the final model. We report the effect and I2 for the final models only. These analyses were conducted in STATA, version 14.1. No public or patient representatives were directly involved in the draft or process of this review. However, the primary outcomes examined in this review represent a core set recommended for low back pain, which included patient representatives in its development. The countries in which the studies were conducted varied. Fifteen studies were conducted in the United States,142829333440414445464954667072 seven in the United Kingdom,32353839506973 three each in Finland,425271 Australia,365167 and Italy,315565 two each in Sweden,5761 Denmark,5356 Egypt,5860 and India,5964 and one each in Belgium,43 Spain,30 Switzerland,27 the Netherlands,47 Greece,48 Turkey,63 Pakistan,68 and Tunisia.37 All trials were published in English except the trial conducted in Tunisia, which was published in French. A detailed description of the characteristics of the included studies is available on request from the primary author. In total, 9211 patients were examined. Study sample sizes ranged from 21 to 1334 (median 132, interquartile range 64-240). Most studies included middle aged participants (on average, 35-60 years of age) with or without radiating pain. Less than half of the studies examined those with exclusively chronic low back pain273031323436394041484950515658596364656972; however, among those studies that recruited a mixed population, the duration of the pain typically ranged from months to years (see table A in appendix 5). None of the studies made a clear distinction between persistent low back pain or exacerbation of a chronic condition. We would have liked to have described whether the research team was multidisciplinary and whether it included clinicians who were involved in the treatment, but in many cases these data were not reported. Importantly, no official disclosure was reported in most of the studies, although many were older studies for which disclosure was not standard procedure at the time. Three studies were identified as having a major flaw and were excluded from the meta-analyses.323951 Less than half of the studies (45% (n=21/47)) used both an adequate sequence generation and an adequate allocation procedure.272829303134364041424447536163676970717375 Five studies (10% (n=5/47)) attempted to blind patients to the assigned intervention by providing a sham treatment,3749606672 while in one study it was unclear.58 More than half of the studies (57% (n=27/47)) provided an adequate overview of withdrawals or drop-outs and kept these to a minimum.142729303133343536373841424345474854596165676970717275 Less than one third of the studies (30% (n=14/47)) published or registered the protocol, and the reported outcomes were consistent with the protocol.1429303641434448536162637172 Appendix 4 summarises the risk of bias assessments. Table 1 summarises the treatment effects and quality of the evidence for all comparisons. Twenty six studies compared the effects of SMT with recommended interventions.2829313234363940424445474851525355575961626368697175 Data could not be extracted from five studies,3239475155 three of which had a major flaw. Pain—Moderate quality evidence suggested that SMT is not statistically better than recommended interventions at one month and 12 months, although the difference was significant at six months. The size of the effect was, however, not clinically relevant (fig 2). Exclusion of extreme outliers accounted for a large percentage of the statistical heterogeneity for this outcome at one month (mean difference −0.39, 95% confidence interval −2.41 to 1.62; participants=3005; studies=23; I2=44%), while the overall effect remained virtually unchanged. Back specific functional status—Moderate quality evidence suggested that SMT results in a small, statistically better effect than recommended interventions at one month but not statistically better effect at six and 12 months (fig 3). Exclusion of extreme outliers accounted for a large percentage of the statistical heterogeneity for this outcome at one month (SMD −0.12, 95% confidence interval −0.23 to −0.01; participants=2907; studies=22; I2=44%), while the overall effect remained virtually unchanged. Pain—High quality evidence suggested that SMT results in a small, statistically significant but not clinically better effect than non-recommended interventions at one month. Moderate quality evidence suggested that SMT results in a statistically significant but not clinically better effect at six months, and low quality evidence that SMT results in a statistically significant but not clinically better effect at 12 months (fig A in appendix 5). Back specific functional status—High quality evidence suggested that SMT results in a small to moderate statistically and clinically better effect than non-recommended interventions at one month. 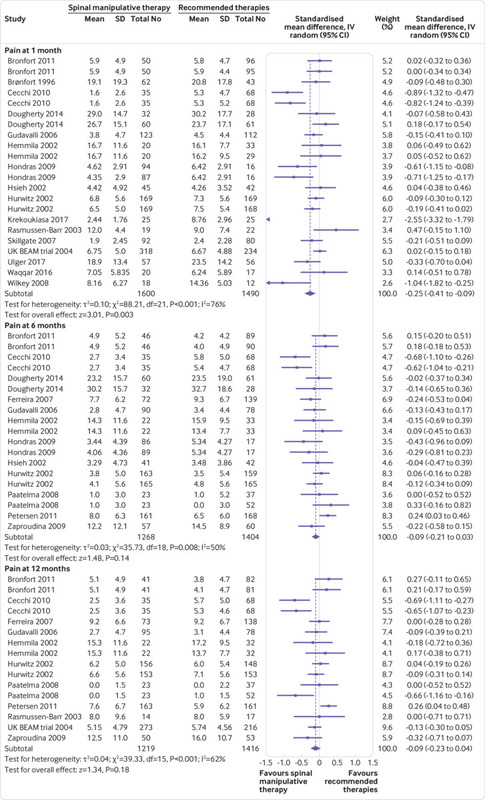 Moderate quality evidence suggested that SMT results in a small, statistically significant and clinically better effect at six months, and low quality evidence that SMT results in a small to moderate, statistically significant and clinically better effect at 12 months (fig B in appendix 5). Pain—Low quality evidence suggested that SMT does not result in a statistically better effect than sham SMT at one month. Exclusion of an extreme outlier accounted for a large percentage of the statistical heterogeneity for this outcome at this time interval (mean difference −3.49, 95% confidence interval −6.03 to −0.94; participants=781; studies=9; I2=5%), while the overall effect remained virtually unchanged. Additionally, very low quality evidence suggested that SMT does not result in a statistically better effect than sham SMT at six and 12 months (fig C in appendix 5). Back specific functional status—Low quality evidence suggested that SMT results in a moderate to strong statistically significant and clinically better effect than sham SMT at one month. Exclusion of an extreme outlier accounted for a large percentage of the statistical heterogeneity for this outcome at this time interval (SMD −0.27, 95% confidence interval −0.52 to −0.02; participants=698; studies=7; I2=39%), resulting in a small, clinically better effect in favour of SMT. Additionally, very low quality evidence suggested that SMT does not result in a statistically significant better effect than sham SMT at six and 12 months (fig D in appendix 5). HVLA SMT versus LVLA SMT—Four studies examined the effect of HVLA SMT versus LVLA SMT.30334470 We found no statistically significant difference in effect between either technique for pain relief or improvement in function at one month (judged to be moderate and low quality, respectively). The evidence at six months was of low quality and there were no data for 12 months. Mobilisation versus mobilisation—One small study with a high risk of bias for many criteria compared the effects of Maitland mobilisation with Mulligan mobilisation.58 The authors concluded that there was no significant difference between either technique for the short term reduction of pain. Prediction intervals—Prediction intervals for the effect of SMT versus recommended therapies suggested a small to moderate effect in favour of either therapy, meaning that the therapy chosen by patients and clinicians should be based on factors other than effectiveness alone. Data were too few for the other comparisons to ascribe a meaningful interpretation to those results (table B in appendix 5). We conducted meta-regression only for the comparison of SMT with recommended therapies. In general, two variables were typically included in the final model: multimodal SMT and duration of the low back pain (tables C and D in appendix 5). However, these variables did not explain the statistical heterogeneity for short term outcomes, and marginally for intermediate and long term outcomes. The moderator effects were also typically small and not clinically relevant. This meant that there was appreciably no difference in effect when SMT was offered as a package of care (as opposed to SMT alone) or when patients with exclusively chronic low back pain were included (as opposed to a mixed population). Meta-regression was not conducted for the other comparisons because data were too few to ascribe any meaningful interpretation to those results. Additionally, no appreciable difference was found in effects for risk of bias or when the effect of SMT versus exercise was examined. Publication bias—Publication bias was only examined for SMT versus recommended therapies, owing to the paucity of data for the other comparisons. We constructed two separate funnels plots for pain and functional status for all time measurements (figs G and H in appendix 5). Although these funnel plots do not suggest publication bias, this cannot be ruled out. In the treatment of chronic low back pain in adults, moderate quality evidence suggests that spinal manipulative therapy (SMT) results in similar outcomes to recommended therapies for short, intermediate, and long term pain relief as well as improvement in function. In addition, the quality of evidence varied suggesting that SMT does not result in clinically better effects for pain relief but does result in clinically better short term improvement in function compared with non-recommended therapies, or sham, and when included as an adjuvant therapy. Most studies examined the effect of SMT in a pragmatic setting and might therefore be considered the most robust evidence. Given the considerable data available, we can now calculate within reasonable certainty the effect of SMT in this setting as well as the impact of a future, methodologically well conducted trial (as determined by the prediction intervals). Evidence for the remaining comparators was considered to be of moderate quality or lower (with the exception of the short term effect of SMT versus non-recommended therapies), suggesting some uncertainty around these effect estimates. However, it is questionable whether additional studies are necessary, and it is debatable whether studies that examine the effect of SMT compared with non-recommended therapies or sham (placebo) therapies will add further to our understanding. In fact, during this update we identified several, recent small pragmatic studies with a high risk of bias.4858596368 This is of concern because these types of studies only weaken rather than strengthen the evidence and should be discouraged. Curiously, this finding contrasts with an earlier study that identified a trend towards better quality studies investigating SMT.77 Future studies should focus on identifying moderators likely to influence treatment effects (such as socioeconomic status, level of education), and this is a line of evidence that we are currently pursuing in an individual participant data meta-analysis. The incidence of adverse events and serious adverse events based on the studies included here are difficult to assess because less than half of the randomised controlled trials examined these, and in most of the studies the methodology was unclear. Importantly, given the low incidence of serious adverse events, randomised controlled trials are not the design of choice. Based on a recent systematic review, serious adverse events after SMT for low back pain are thought to be rare and include case reports of cauda equina syndrome, fractures, and neurological or vascular compromise.83 A recent comprehensive scoping review, which examined the risks of manual treatments to the spine, identified 250 articles in which serious adverse events were reported. Most of these focused on adverse events after treatment to the neck.84 The body of evidence, which includes data from large, prospective observational studies of SMT, suggests that benign adverse events are common and serious adverse events are rare. The incidence and causal relations with serious adverse events are difficult to establish, in part due to inherent methodological limitations of the included studies. Importantly, predictors of these events are unclear. Given this, clinicians should ensure that patients are fully informed of potential risks before treatment. Although we focused on the effects of SMT in this review, the costs associated with care should also be considered. The most recent systematic review on cost effectiveness of non-invasive and non-drug interventions for the treatment of low back pain concluded that manual treatments, including SMT and massage, should be considered a cost effective option.85 This conclusion, however, was based on 10 studies, only two of which are included in this review.7386 Another recent systematic review that focused on the effects of SMT for spinal pain concluded that SMT is a cost effective option when used alone or in combination with other treatments.87 However, this conclusion was based on six studies, including studies that examined the effect of SMT for the treatment of neck pain, and was limited to the same two studies cited previously. 7386 To our knowledge, no other economic evaluations have been done of SMT for the treatment of chronic low back pain. Although we did not actively search for these types of evaluations because that was an objective of this review, it is unlikely we missed any economic evaluations in these studies. The primary author knows this literature well and regularly attends meetings in which trial results are presented. Furthermore, it is likely that studies as well as protocols would have referenced an economic evaluation if it existed. Therefore, it remains to be determined whether SMT is a cost effective option for the treatment of chronic low back pain. The most important limitations are those inherent to most (if not all) systematic reviews—namely, the limited number of studies with a low risk of bias, as well as ambiguity about the impact of publication bias. Furthermore, we could not resolve the problem related to statistical heterogeneity nor is this likely to be resolved in future reviews: studies of SMT are conducted in varied settings, among different populations, using several methods of recruitment and SMT techniques that are subsequently compared with various types of therapies. Finally, in most studies it was unclear if the research team was multidisciplinary, and whether it included clinicians involved in the treatment of patients, but perhaps most importantly, given that disclosure was often not reported, potential conflicts of interest cannot be ruled out. Future trials of SMT for low back pain should include an economic evaluation; an analysis of the proportion of patients who achieved a specified level of pain relief (eg, percentage of those experiencing 50% pain improvement); a better description of the qualitative components of SMT, such as the context of the visit, patient beliefs, and preferences, and also quantitative components, such as factors that are likely to influence treatment. The evidence suggests that SMT results in a modest, average clinical effect at best: future trials on the effect of SMT for chronic low back pain are not necessary, unless they contain a novel approach, are well conducted, and address any of these specific recommendations. Private or governmental agencies should refrain from funding small trials that are poorly conceived. SMT produces similar effects to recommended therapies for chronic low back pain but results in clinically better effects for short term improvement in function compared with non-recommended therapies, sham therapy, or when added as an adjuvant therapy. Clinicians should inform their patients of the potential risks of adverse events associated with SMT. We thank the editorial board of the Cochrane Back and Neck Review Group for its constructive comments, particularly Shireen Harbin, and those authors who provided clarification of their trials for this update. Systematic review registration: A protocol of this review is registered with the Cochrane Library. Rubinstein SM, van Middelkoop M, Assendelft WJJ, de Boer M, van Tulder MW. Spinal manipulative therapy for chronic low-back pain. Cochrane Database Syst Rev 2009(4):CD008112; doi:10.1002/14651858.CD008112. Contributors: SMR, MWvT, and WJJA conceived and designed the study. SMR, AdeZ, MRdeB, and MWvT analysed and interpreted the data. SMR, AdeZ, and MWvT drafted the review. All authors critically revised the article for important intellectual content and gave final approval for the article. MRdeB provided statistical expertise. SMR provided administrative, technical, and logistical support. SMR, AdeZ, and MvM (2011 publication) and MRdeB and WJJA (2004 publication) collected and assembled the data. The corresponding author attests that all listed authors meet authorship criteria and that no others meeting the criteria have been omitted. Competing interests: All authors have completed the ICMJE uniform disclosure form at www.icmje.org/coi_disclosure.pdf and declare: SMR received personal grants from the European Chiropractors’ Union (ECU), the European Centre for Chiropractic Research Excellence (ECCRE), the Belgian Chiropractic Association (BVC) and the Netherlands Chiropractic Association (NCA) for his position at the Vrije Universiteit Amsterdam. He also received funding for a research project on chiropractic care for the elderly from the European Centre for Chiropractic Research and Excellence (ECCRE). AdeZ received a grant from the European Chiropractors’ Union (ECU) (grant No A14.03), for an independent study on the effects of SMT. SMR and AdeZ declare that they work in their own private clinics as chiropractors. The remaining authors received no support from any organisation for the submitted work; have no financial relationships with any organisations that might have an interest in the submitted work in the previous three years; and have no other relationships or activities that could appear to have influenced the submitted work. Data sharing: Details of the characteristics of the included studies are available from the corresponding author at s.m.rubinstein@vu.nl. Transparency: All authors affirm that the manuscript is an honest, accurate, and transparent account of the study being reported; that no important aspects of the study have been omitted; and that any discrepancies from the study as planned (and, if relevant, registered) have been explained. Bons SCS, Borg MAJP, Van den Donk M, et al. NHG guideline for aspecific low-back pain, 2017. www.nhgorg/standaarden/samenvatting/aspecifieke-lagerugpijn#idp23613872. NICE guideline. Low back pain and sciatica in over 16s: assessment and management. www.nice.org.uk/guidance/NG59/chapter/Recommendations#non-invasive-treatments-for-low-back-pain-and-sciatica, 2016.
. The significance of the manipulative crack and of other articular noises. Ann Swiss Chiro Assoc1969;4:47-68.
. Integrating osteopathic approaches based on biopsychosocial therapeutic mechanisms. Part 1: The mechanisms. Int J Osteopath Med2017;25:30-41doi:10.1016/j.ijosm.2017.05.002. Higgins JPT. Green S. Cochrane Handbook for Systematic Reviews of Interventions. 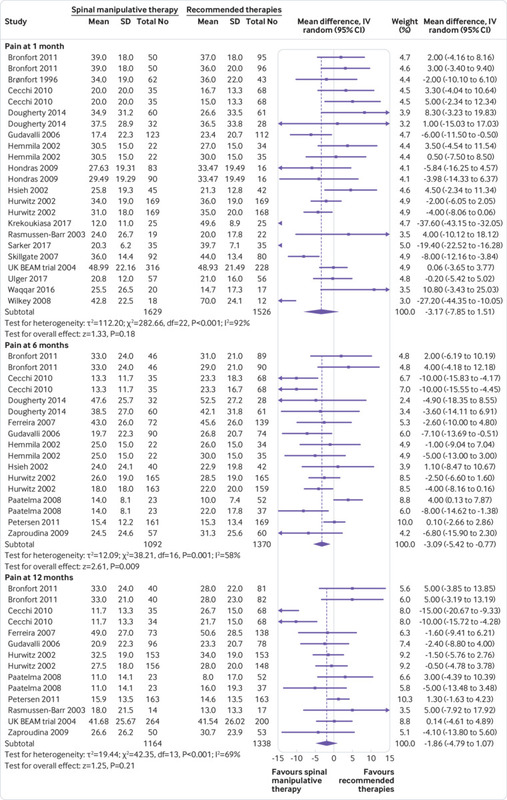 The Cochrane Collaboration, 2011;Version 5.1.0 [updated March 2011].
. Plea for routinely presenting prediction intervals in meta-analysis. BMJ Open2016;6:e010247. doi:10.1136/bmjopen-e47.
. Statistical Power Analysis for the Behavioral Sciences.Academic Press, 1988: 1-474.
. A prospective study of patients with chronic back pain randomised to group exercise, physiotherapy or osteopathy. Physiotherapy2008;94:21-8doi:10.1016/j.physio.2007.04.014.
. A prospective randomised controlled trial of spinal manipulation and ultrasound in the treatment of chronic low back pain. Physiotherapy2006;92:34-42doi:10.1016/j.physio.2005.05.005.
. Efficacy of various forms of conservative treatment in low back pain: a comparative study. Neuro-Orthopedics1988;6:28-35.
. Mulligan versus Maitland mobilizations in patients with chronic low back dysfunction. Int J Pharm Tech Res2016;9:92-9.
. Effect of spinal manipulation on postural instability in patients with non specific low back pain. Int J Pharm Bio Sci2017;7:992-9.
. Narkeesh. Pain, range of motion and back strength in chronic mechanical low back pain before & after lumbar mobilisation. Int J Physiother Res2013;3:48-57.
. Short term trial of chiropractic adjustments for the relief of chronic low back pain. Man Med1986;2:63-7. Chou R, Deyo R, Friedly J, et al. Noninvasive Treatments for Low Back Pain. Rockville (MD): Agency for Healthcare Research and Quality (US); 2016 Feb Report No: 16-EHC004-EF AHRQ Comparative Effectiveness Reviews 2016; Report No: 16-ReporEHC004-EF.